I have tried a LOT of serums this year. Dozens in fact. I was sent a huge boxful to try out when I was a judge at the Natural Health International Beauty Awards earlier in the year. And it was a hard choice to make because there were lots of good ones. However I still have them all and am taking full advantage because I LOVE a serum. I much prefer them to a moisturiser as they are absorbed so much better. If I need a bit more nourishment I might add a few drops of facial oil to the serum or wear a moisturiser on top of it. And because they all come via the Natural Beauty Awards, they are all natural, chemical free and usually contain at least some organic ingredients. I like this one because it’s very light, easily absorbs and is packed full of vitamin C. I’ve often spoken about how vitamin C is one of the most effective things you can use on your face. I’ve had amazing results (particularly round my eyes) with vitamin C over the years and am a big fan. This one helps fade pigmentation and and helps smooth out wrinkles. This is a light gel that absorbs instantly. It smooths and evens out the skin and although light feels rich and nourishing. It left my skin feeling very soft. The organic aloe vera helps calm any inflammation and so would be good for sensitive skins. Because the gel is so light, it could be used on an oily skin as well as a dry skin. Rejuvenating. A light gel-like cream that disappears into the skin, this serum is packed full of vitamins and antioxidants to revitalise undernourished skin. It helps reduce pigmentation and protects the skin from the elements and pollution. Also great to use at night either on it’s own or if like me your skin is a bit dry, with a facial oil over it. Contains things like green tea and co-enzyme Q10. Usually I don’t like serums that are an oil as I feel a serum should be different to a facial oil. And who wants oil all over their face during the day? However I really like this one which is an extremely light oil that absorbs very well. It contains omega 3, 6 and 9 oils as well as evening primrose oil. It’s extremely nourishing and I highly recommend it if you have very dry or dehydrated skin. It does leave a slight sheen on the face for the first hour or so but then seems to disappear leaving the skin lovely and soft. I wouldn’t use this if you have an oily skin. I really like the texture of this creamy gel that disappears into the skin leaving it super soft and hydrated. This serum is firming and keeps the skin beautifully supple. It contains hyaluronic acid which keeps skin moist and plump. Definitely a favourite. Serums go on first and then you can add moisturiser on top. Serums absorb more easily into the skin as the molecules of a moisturiser are usually too big and act more as a barrier against moisture loss. I’ll sometimes just add a few drops of a facial oil to a serum but sometimes I’ll use a moisturiser. Some serums are just for day and some are for day and night. I quite like using during the day and then using a facial oil or balm at night. Great article thanks. 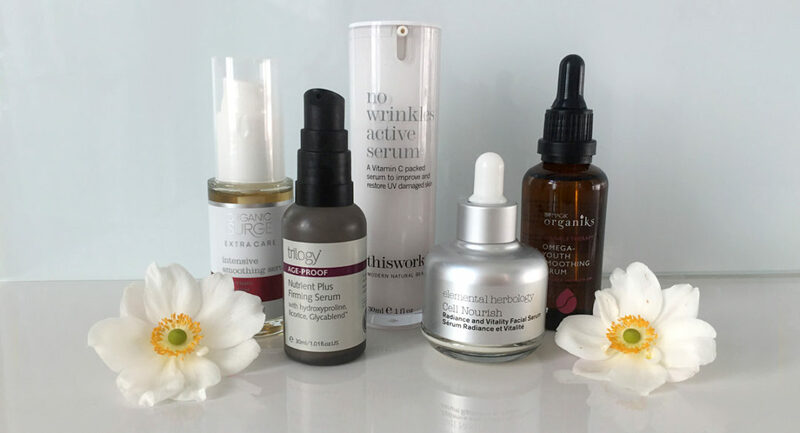 I love serums too – I use Trilogy CoQ10 serum. Can I ask what brand of Vitamin C you use around your eyes? Is it the This Works serum? I’m looking for something to use just underneath my eyes for skin that is starting to get lines/looking crepey. Thanks. I’ve used all kinds of vitamin C products and the trick is to find a potent and stable one. One of the very best is a vitamin C powder by Julia Hunter on her skinfitnessplus website which is in the US. It’s quite strong and I find it’s too much to use every day specially round the eye area but is very effective.